I went to New York City to attend the New Yorker Festival, an annual event hosted by the magazine. Among other things, I heard Jill Lepore talk about "The Hidden History of Privacy." Facebook was a topic, as might be expected. Lepore notes, with some irony, that the only thing we seem to want more than "privacy" is "publicity." I am not sure whether or not she was speaking personally, but I note that Lepore does maintain a "public figure" page on Facebook. Helene Moglen is an Emerita Professor of Literature at UCSC, and she doesn't seem to have a Facebook presence at all (or not one that I could find, at any rate). She will, nonetheless, soon be presenting the topic "From Frankenstein to Facebook," in a set of "Reflections on the Dissolution of the Humanities." Moglen's lecture will be given on Tuesday, October 29, 2013, starting at 7:00 p.m. in the UCSC Music Center Recital Hall. It is free and open to the public. There is more information here. 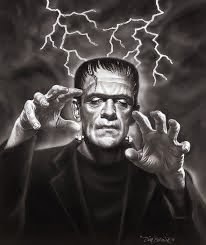 The Frankenstein story, I think, can properly be thought of as a cautionary tale about how humans may lose control of their own creations (and the bad consequences of that), though in the case of Frankenstein this perhaps occurs because the creation is not loved enough by the creator. Query how the Frankenstein story relates to Facebook. The flyer for the Moglen lecture suggests that we may not really be in charge of our Facebook profiles, but that they may actually have "mastered us." I will be interested in hearing the argument. And if anything seems noteworthy, I will do a new posting, right here, and let all my Friends on Facebook know. That is, if Facebook lets me do it!